Lane Departure and Sway Warning both activate a chime sound when your vehicle begins to drift or is too close to another lane. This alert helps to keep you on the straight and narrow. Select 2017 Forester, Impreza, Outback and Legacy models also incorporate Lane Keep Assist (Steering assistance control) to minimize lane deviations at speeds over 65km/hr. With Subaru EyeSight Advanced Driver Assist System, the Subaru Crosstrek, Forester, Impreza, Legacy and Outback earn a Top Safety Pick rating, combined with a Superior rating for front crash prevention - the highest ratings possible! 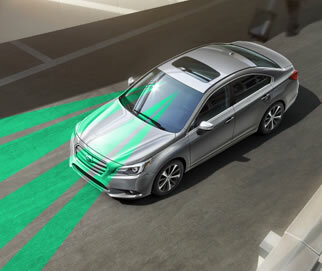 EyeSight is a driver-assist system which may not operate optimally under all driving conditions. The driver is always responsible for safe and attentive driving. System effectiveness depends on many factors such as vehicle maintenance, and weather and road conditions. See Owner’s Manual for complete details on system operation and limitations.